POETRY CLUB 2 Lines Poetry Heart Touching Image Poetry Heart Touching Poetry Image Poetry Sad Poetry Urdu Poetry Khamoshi Buht Kuch Khti Hy ...! Khamoshi Buht Kuch Khti Hy ...! Kaan Lga Kr Nahi, Dil Laga Kr Sunen ...! Poetry is a sort of literature or writing which attempts to the emotions of readers or imaginations of readers. There are main three types of poetry which are Narrative Poetry, Dramatic Poetry, Lyrical Poetry. In current era many of the types of poetry exists such as December Poetry, Sad Poetry, Romantic Poetry, Love Poetry, Image Poetry, New Year, 2 line, 4 line, Wedding Poetry, Eid Poetry etc. Common point is that all of these type of poetry belongs to Lyrical Poetry category. Poetry Club is an online platform where you will find all types of Poetry including Image Poetry and Texture (Urdu and Roman) Poetry. Here you will find tons of poetry. 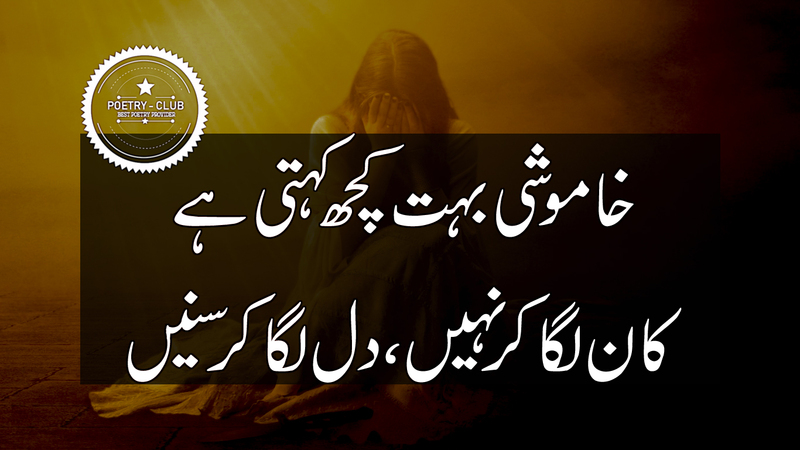 Not only Poetry you will also find all type of Quotes in English and Urdu languages.